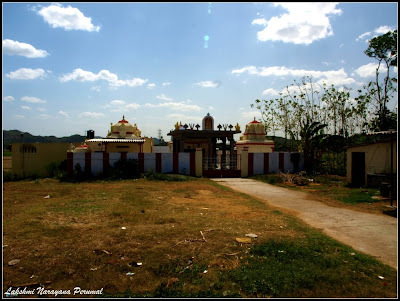 A beautiful temple located in a calm serene village, Puli Kundram. This is located about 8 kms from Tirukazhukundram. Though there are not frequent transports to this temple, the roads are really good and those who want to reach the temple in their two wheelers or cars should not have any problems. Myself and Rajesh set out for the journey to visit this temple (we discovered this temple about 2 years ago, when we were returning to Mahabalipuram from Tirukazhukundram), as we had decided 2 years back. Yeah I know – too early. We planned to start from Rajesh’s place around 9:00am, but as usual we start late by over an hour! Though the sun was beating down on us, we decided to proceed on our journey. We travelled along the OMR road and took the diversion towards Chengulpet from Tiruporur. After travelling in that road for about 5 kms or so, the road split into two. As usual we took the wrong one and ventured into the reserve forest area. On both sides just forest with small villages appearing occasionally, we proceeded on the journey. After travelling for over 45 minutes in the beaten track we saw an archway that lead to another temple. We saw the sign board and it read “Jambugeswarar Temple – 600 meters”. Intrigued by the new discovery we decided to take a detour into that village and check out on that temple. We half expected the temple to be open as it was about 11:30am already. I will try to give more descriptions on the temple and some photos shortly. By the time we started from the temple, it was about 12:30 and we had absolutely no hopes of visiting the Lakshmi Narayana temple on time. So we decided that even if we are not able to enter into the temple, we will definitely pray from outside the temple and get some water from the priest of the temple, whose house is just next to the temple. Surprised? So were we when we drank the water the priest gave us on our previous visit! I had heard myths and epics referring to nectar as a sweet potion, but realized it was true when we drank that water. It was taken from a well nearby. The water was surprisingly cool and sweet. Something we cannot even dream of in Chennai even during winter or rainy seasons. Coming back to present, we proceeded further from Jambugeswarar Temple further towards Chengulpet, but by now we have realized that we had actually taken the wrong route. Chengulpet junction was just 2 kms from that point, so we decided to go up there and take the correct route. We had some refreshments in the junction (we have no idea of be struck by heat). Got the correct directions to the village from the shop keeper and continued on the correct path. When we reached the temple, we saw that the gate has been closed, which is something we already knew. So we decided to park the vehicle outside the priest’s house, which is the only house in that very small street, just do a prayer standing outside the temple, drink some water and get back. The moment we stopped in front of the priest’s house, he came out and welcomed us and offered us water to drink. As if he already knew what was in our minds. He also asked us why we were so late. This is something which did not strike us at that time, but thinking about the day’s incidents, I am now wondering, if he had been expecting some visitors or if that is just a comment! We explained him that we missed the route and ended up discovering another temple on the way and stopped by for sometime before heading over here. After having water, when we were thinking of thanking him and leaving, the priest went inside his house and brought the keys for the temple and asked us to follow him. He opened the temple let us in and performed prayers for our benefit and explained about the temple. The temple was built about 400 years back during the reign of Krishnadeva Raya of Vijayanagar kingdom. The temple, though small, has all the deities. Everything is well maintained, clean and all the poojas are performed everyday without fail by the priest and his family. The priest’s son, also a priest in the temple (he was the one whom we met about 2 years back) had been working for Co-optex, a government owned textile group, until 10 years ago came to this village and took up the path of religion. After worshipping in the temple and taking some good advices from the priest, when we were about to leave, the priest realized it was over 2:00pm and asked us to take some Prasadam (offering done to the Lord). But we never even thought that he is going to give each of us a big Lotus leaf full of Coconut rice and Curd rice. Never before have we been treated with such hospitality that both our hearts and stomach were filled. We had the Prasadam, took the blessings from the priest and started back on our journey, thinking very firmly that we need to come back again for the pleasant atmosphere of the temple and the humane treatment of the Men of God! It is said that the Lord Lakshmi Narayana showers his blessings on his worshippers, with every wealth, especially for married couples who are longing for the wealth of children. The revenue for the temple comes from the donations the devotees. For people who want to reach the temple, you can either do so by taking the route to Chengulpet and from there take to road that goes to Tirukazhukundram. Before entering the Tirukazhukundram town, there is a bypass road which will take you directly to this village. Or you can take the OMR (Old Mahabalipuram Road – The new IT Expressway) and take a right turn after Tiruporur (there will be a roundtana with a sign board to Chengulpet). This road is a bypass to Chengulpet. After travelling for some distance in this road, there will be a two way split in which the left split to Tirukazhukundram has to be taken. You will have to travel for about 30 kms to reach the Pulikundram village. The Village is located to the right side of the road (when going towards Thirukazhukundram).We will have to be watchful as it is a very small village and there is every chance that one might miss it. It narrates what exactly happened on that day! Still remembering that hospitality of that priest family!